The 1911 handgun has been many things during its hundred-plus years of existence: a military sidearm, a police sidearm, a special-units weapon, a home-defense weapon, and–with the burgeoning market for 1911s made out of lighter materials–a popular option for concealed carry, too. But even when the weight of the gun is lessened through the use of various materials, one drawback with the 1911 has been its cumbersome shape/size for average-sized persons who need a gun they can carry and truly conceal. Enter Blade Tech’s Nano IWB Holster for the 1911 4.25 Commander model (IWB = Inside the Waistband). I have a Ruger 1911 Commander model that weighs 36.4 ounces. So it’s bulky and much heavier than other concealed-carry options. But the Blade Tech Nano takes care of the bulk and distributes the weight in a way that allows me to carry the gun comfortably–and fully concealed–while wearing cargo shorts and a loose fitting t-shirt or a relaxed, button-up short sleeve. The Nano holster is made from a durable thermoplastic that holds its shape and holds the gun in place. 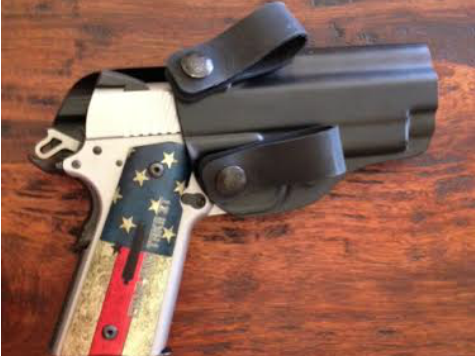 The fact that it holds its shape also makes drawing the gun simple–the gun comes out cleanly when drawn and pops back in place when re-holstered. Friends in the firearm industry told me about the holster, and I acquired one and carried my Ruger in it for an extended period of time to see if it was as good as advertised. The bottom line–the Blade Tech Nano makes it comfortable to conceal and carry a 1911 handgun. And for 1911 lovers, knowing that such a proven weapon is within arm’s reach at all times provides peace of mind.